Better Homes and Gardens has a cook book out called comfort foods. This is not your Southern comfort food, but more of a MidWest type comfort food. 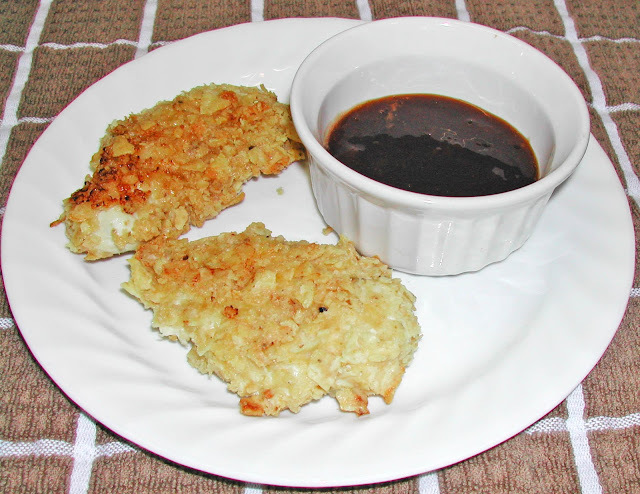 I enjoyed reading it and one of the recipes I use is for baked chicken Strips. We like them baked and if you use GF tortilla chips your GF eaters can have them too. We think the sour cream added to the egg used to hold the chips on gives them a nice flavor. I do buy chicken tenders from our local Fareway store, but chicken breasts are easily cut into strips. Preheat oven to 400°F. In a medium bowl combine egg, sour cream, salt, garlic powder and pepper, Cut chicken lengthwise into ¾ inch thick strips. Add chicken to egg mixture, stir to coat. Brush a 15x10x1 inch baking pan with oil; set aside. Dip the chicken strips a few at a time, into the pretzels or chips turning and pressing strips to coat. Arrange chicken in a single layer in the prepared baking pan; leaving space between each piece. Bake uncovered for 8 to 10 minutes or until chicken is no longer pink, (170°) turning strips over at 5 minutes. Serve warm with your favorite dipping sauce. hum.......interesting. Pretzels or tortilla's for the coating. May have to try it. I make it with the tortilla chips, but I think the pretzels would be very good. I just use the chips as I can use GF chips cheaper than GF pretzels. What you want is the salty, crispy coating to contrast with the egg and sour cream. Chicken is fairly bland on its own so this is another good way to fix it.